The HOSPACE2018 Conference and Exhibition was about bringing together knowledge and connections for technology, finance and revenue management in the hospitality sector. Hospitality and Leisure sit within the very core of the Percipient Sage team, so when we saw an opportunity to sponsor the HOSPACE2018 event, we jumped at it. Focusing on key industry developments our resident compliance expert, Jo Fuller, delivered an insightful workshop on the CFO’s responsibility for financial insight and compliance for 2019 and beyond. 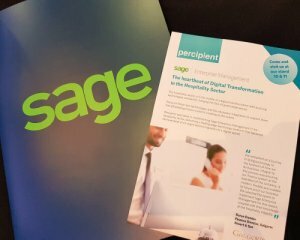 Discussing important industry issues and the implications of Brexit, IFRS16 and Making Tax Digital, Jo highlighted how these pressing financial compliance’s can be realised with Sage Business Cloud Enterprise Management. By making digital systems the ‘lifeblood’ of your finance function, and integrating with other business critical operations, you will gain a greater insight into your performance with fast, flexible and easy to digest data visualisation. Making Tax Digital (MTD) is the biggest shake-up to the UK tax system in a generation. It involves a range of initiatives by HRMC to move business related tax reporting online, in a bid to make it more accurate, more reliable and more efficient. Sage Enterprise Management handles compliance related complexities. With an in-built tax platform that can be used to gain compliance worldwide, there is no need to purchase country specific tax modules. A feature that our multinational hospitality customers are already benefiting from. Events like HOSPACE are about connecting like-minded hospitality professionals to share knowledge and build long-lasting relationships. That’s why we are extremely proud to be able to involve our customers in HOSPACE2018. You may have seen our recent video of our involvement with Bristol Sport’s financial transformation on our exhibition stand, or maybe you had a chat with our guests from City Cruises and Sage. Building winning partnerships is key to everything we believe at Percipient. From our staff, to our partners at Sage and our customers, people are at the heart of everything we do. If you would like to know more about what we do, or want to make an appointment with our Percipient Sage team, call us on 01606 871332 or get in touch and we’ll get back to you.